The design-build form of project delivery is a system of contracting whereby one entity performs both architectural/engineering and construction under one single contract. Under this arrangement, the design builder warrants to the contracting agency that it will produce design documents that are complete and free from error (design-builder takes the risk). The selection process under design-build contracting can be in the form of a negotiated process involving one or more contracts, or a competitive process based on some combination of price, duration, and proposer qualifications. Portions of the overall design or construction work can be performed by the design-build entity or subcontracted out to other companies that may or may not be part of the design-build team. Many envision design-build as the BIM solution. Design-build delivery is much more integrated than design-bid-build and with the introduction of a design assist agreement, can create a strong foundation for collaborative practice. The design-assist agreement dovetails into a typical design-build contract and allows for the contracting team to have early involvement in a project, with a concession for the potential to recapture the fee when the design portion ends, if not selected for the project. Although the NDPW holds no specific BIM contracts currently, it does strongly promote the early formation and collaboration of project teams. This might change as more owners, and specifically those who most often utilize the design-build form of agreement, demand BIM. Ultimately, the framework of design-build is structured to facilitate the use of BIM. However, some of the typical project deliverable timelines will need to be shifted to facilitate creating BIM documentation as opposed to CAD documentation to facilitate the new resources and tools available to construction managers to deliver a better project. In design-build delivery, the contractor or architect is contracted as a single entity known as the design-builder or design-build contractor. The purpose of this type of contract is to increase accountability and have a single source of project delivery. 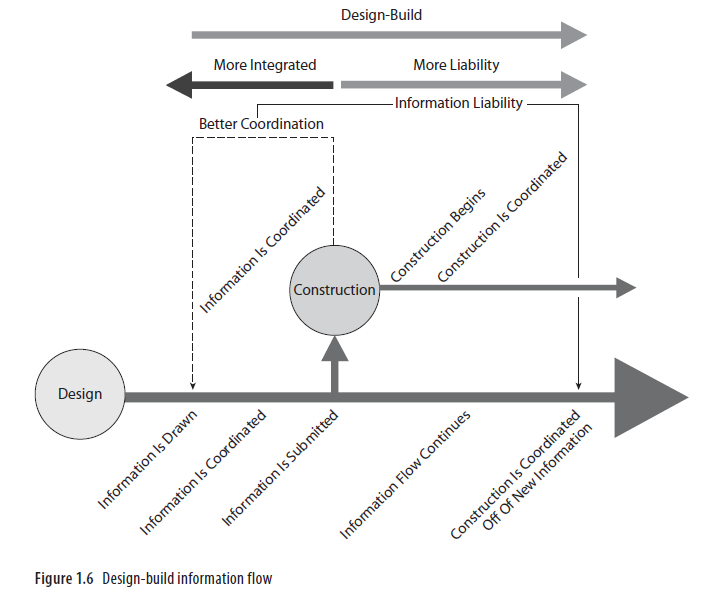 In this type of system (Figure 1.6), the design-builder is responsible for streamlining the process by combining the design, permit, and construction tasks. If the lead is the architect, the contract is for a “design-led design-build” project. If the lead is the contractor, the contract is for a “contractor-led design-build” project. In either case, both parties are under agreement to design and construct the owner’s building in budget and on time. The rising popularity of design-build shows it to be one of the more effective ways of delivering a project. However, there can be inaccuracies and ambiguities in this process because the construction can happen in parallel with the completion of the design documentation. The process is weak in design review because the design is still being completed as the project is being constructed. Quality control tasks associated with the design team become secondary, because the primary goal becomes completion of the project under a contractor-led agreement. The quality of design produced by the architect and design team can suffer as well, because the contractor’s responsibility of coordinating trades and schedules on a working construction site becomes the driving factor for the project, not aesthetics. Conversely, in an architect-led design-build project, there is the potential for the focus to become the aesthetic and design elements of a project instead of the project schedule or other construction-related tasks. A fundamental issue with a design-build project is that ultimately one project team member has seniority over the other by default. The fact is that whether it is the contractor or the architect, by choosing one or the other, the project team is not all on a level playing field, which can ultimately lead to project complications later. Design-build’s efficiencies are in overlapping the design phase with the construction phase to shorten schedule and reduce project costs. To efficiently use the design-build delivery, you need a balance among the team members, built upon a schedule that enables the use of BIM processes. Remember that BIM is not necessarily a fast-track means of delivering a project. Rather, it is a technology that allows for more coordination before the project is constructed due to streamlined documentation processes. Information flow in this type of project delivery begins with the initial design produced by the architect, as presented to the owner for review. This design is then used by the contractor to begin putting together an estimate and schedule for the project. As many architects and contractors know, the fi rst design is rarely the one chosen and built. So while the contractor is assigning a cost to the first design proposal, the design is already outdated and incorrect; the architect is now revising the design per the owner’s design changes and contractor input. This continues throughout the project process, because the architect is constantly trying to stay ahead of the contractor and the contractor is trying to catch up to the architect’s design drawings. The construction documentation phase of a design-build process often begins with 50 percent of the construction documents going to local code authorities to secure a permit. Construction planning and site development begin at this point in anticipation of 100 percent of the drawings being finalized. The mechanical, electrical, and plumbing engineers’ drawings, as well as the specifications, are submitted in tandem with these documents. Engineers in a design-build contract are contracted directly with either the architect or the contractor and typically engage the design at the design development level of the project and in some special cases during schematic design. The engineers then begin to create their layouts, complete calculations, and size equipment based on the architect’s design. The contractor then begins to assign costs to the engineers’ layouts as well as the architect’s drawings, while simultaneously beginning construction on the project. The construction of a building while design documents are being completed is unique to a design-build process. For example, allowing for the construction of certain packages of work, such as concrete or steel, requires careful coordination with the designers and engineers to make sure that as their designs are being completed they don’t alter or interfere with work already being done. Although this is an opportunity for BIM to shine in this type of delivery, it is also a challenge to constantly update the composite BIM with new information from the architects and engineers. PDF fi les are readily shared, because the team is responsible for building the project together; as one benefits, so does the other. 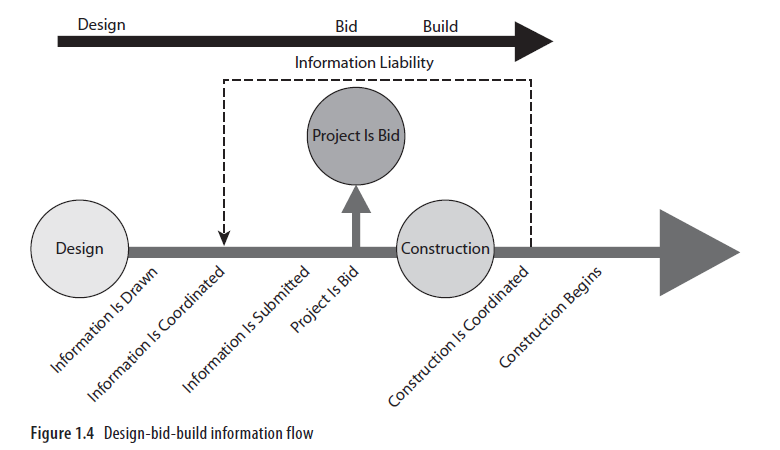 For this reason, the formality and rigor of document sharing are reduced when compared to the design-bid-build means of delivery. Sometimes, because of the sensitive nature of a firm’s legacy data, the architect or engineer will require a media release or a nondisclosure agreement to be signed by the project team. This is a means of protecting the firm’s database of information from being shared with competition, either intentionally or unintentionally. Many firms deal with company-specific digital information by printing the drawing information into a hard copy or PDF and then deleting the native fi les from the shared documents in order to avoid any issues. The same agreement might be required if BIM is integrated into this type of delivery method and specifically if the general contractor has an in-house design department but is working separately from that department on a project. A BIM type of project documentation can be planned for and coordinated in a design-build process and should be introduced in the initial contract negotiation meetings. Chapter 2 discusses how to build and integrate an information exchange (IE) responsibility plan and a model coordination plan. Both of these, or similar documentation, should be required in a design-build project if the intention is to use BIM in any fashion on a project. Changes in this process are addressed with cost updates. The preliminary contracts usually provide for design alterations and changes throughout the design and construction documentation process. Typically a point of no return takes place in the project, after a final budget has been issued, when design alterations stop and further design changes result in additional project cost or change orders in the field. Conceptually, design-build aims to limit the exposure of uncoordinated items and, through collaboration, increase the viability and accuracy of the project. Yet this process also relies heavily on the integrity of the contractor to deliver the project within budget and schedule, which may be difficult because the quality and interpretation of design documents leaves room for misinterpretation and assumption. Although not all design-build projects are fast-track or require additional construction and design coordination, many times the project is similar in timeline and schedule to a design bid- build delivery, with the major exception that the project team is integrated. A rising perception within the industry is that—just like cheaper isn’t better in a design-bid build project—faster isn’t better in a design-build project. In actuality, the more coordination and clarification that can be accomplished before a shovel ever touches dirt, the more potential issues can be avoided later. Many times in design-build the engineering team provides a performance specification. It is then left to the subcontractor to design and build a system that meets these requirements. Many subcontractors are familiar with this and go about designing and issuing shop drawings for engineering approval. Yet some companies have seen a unique opportunity. Because they ultimately design the mechanical, electrical, or plumbing system and build it, there has been a rise in companies integrating engineering in-house and offering both services. By streamlining internal processes between the engineer and the fabrication shop, many of these companies are becoming more popular, specifically among more integrated teams, because of the coordination they can offer. At the completion of a project using design-build, the O&M manual is issued, along with hard copies of the building drawings, shop drawings, field changes, specifications, change orders, and punch lists. This information is not in a connected format and often is a hybrid of paper and digital documents, just as in other delivery methods. It then becomes the responsibility of the facility manager to correlate this information into usable documentation. BIM in design-build presents a unique opportunity by allowing facility managers to define early on what they expect to see as a deliverable at closeout, not only the type of documentation but also the level of detail within the documentation. 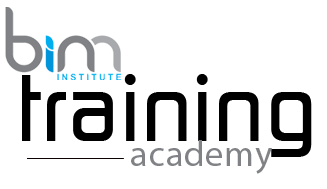 The buzzword of digital O&M manuals pertains to the concept of embedding within BIM components relevant and specific information. Information such as cut sheets, photos, shop drawings, pictures, and URLs can potentially be inserted or linked to model components Combined with a more integrated means of delivery, design-build offers unique opportunities as a delivery method for BIM projects. Design-build is the father of a true BIM process. It introduced the idea that a project team that collaboratively seeks to complete a project can realize efficiencies and profits. Design-build delivery continues to be a good starting point for those interested in beginning integration one step at a time, as well as a means of building a BIM process through hybrid documentation.